Ultrasonic Plant Supervision in the Petrochemical Industry: A Wall-Thickness Measuring System for Fixed Installation on Endangered Piping Locations. Depending on the chemical and physical properties of transported gaseous or fluid media, e.g. their velocity, pipings in the petrochemical industry are often subject to a considerable and permanent wear caused by corrosion and erosion at the inner surface. Locations, where increased wear is expected, must regularly be inspected within short intervalls. However, the endangered locations are usually hard to reach for instrument and personnel. In this paper, a new wall thickness measuring system is described, which is permanently mounted to the outer surface of a pipe and, thus, can permanently monitor the wall thickness at those locations. The system consists of a special ultrasonic transducer, permanently coupled to the outer pipe surface, and an electronic circuit placed nearby. The latter works like a remote thickness gauge and transfers digital thickness values via a serial interface to any desirable location, which may be as far as 1200 meters away. With the current set-up, up to 256 of such systems can be connected to a network. Each wall thickness system of this network has its own identification code and can be adressed from the central host station, so that thickness readings of 256 different measuring locations can be transferred. The central host system collects the data for storage, evaluation and further processing. Piping in plants of the petrochemical industry, e.g. refineries, are often subject of more or less erosion or corrosion at the inside wall. This depends on operational conditions, pipeline materials, and also on the chemical aggressivity of the transported gases or fluids. Both effects can mainly be seen where the flow rate is increased, a multiphase-flow occurs, or where a high concentration of corrosive ingredients is present within the medium. Therefore, especially endangered are pipe bends, locations of reduced cross-section, or connections of external piping into the system, where the additional inflow is redirected towards the main flow. Those endangered locations have to be inspected during regular plant supervision within very short intervalls. However, in many cases they can hardly be reached by the testing personnel, especially in case of pipings mounted several meters above the ground. Sometimes, the locations to be examined are accessible only during a shut-down of the plant or after partial removal of surrounding armatures. For a continuous supervision of those plants, there is a long-wanted desire for a simpler solution of this measuring task. For the measuring locations, which are defined as being endangered, the first task is to permenantly install and connect ultrasonic sensors for the residual wall thickness measurement in such a manner that their measured values can be evaluated at an easily accessible place. Therefore, distances in the order of 100 metres between measurement and evaluation place have to be bridged by a fixed cable installation. The reliable operation is an crucial pre-requisite. Also, such an installation must reduce the cost by saving time for the testing personnel compared to the conventional manual measurement for each location. Prior efforts to solve this problem were not successful due to technical difficulties and economical aspects. If wall thickness probes are connected to an ultrasonic wall thickness gauge with a cable length of 100 metres, a considerable attenuation of the ultrasonic signal caused by the capacitive load and damping of the long cable occurs. An increased amplification can compensate this effect, if these signals are well above the electronic noise level. Much worse are cable reflections: The electronic transmitter pulse and wall thickness signal passes the cable with a speed of approx. 108 m/s and is reflected several times from both ends of the cable. In case of a cable length of 10 m, the reflections occur roughly every 100 ns, which is half of the vibration time for a 5 MHz signal. Like multiple echoes within in a thin steel plate, the multiple signal reflections within the cable produce superposition. Normally an ultrasonic wall thickness signal, e.g. a backwall echo, from a probe connected via a two- metre cable should be narrow with a steep leading edge. The superposed reflections in a long cable produce rising oscillations before the main signal and considerably extend the pulse width. In that case, a reliable wall thickness gauging is no longer possible. The influence of the cable reflections becomes stronger for high testing frequencies and the longer the cable is. To carry out wall thickness measurements by means of a 100 m long cable connection between probe and gauge, at least the transmitter of the initial pulse and a preamplifier for the received signal must be placed near to the probe. In this case, the output of the preamplifier, has to be carefully matched to the impedance of the cable in order to avoid reflections. Furthermore, the transmitter has to be triggered and be fed with current by the remotely installed testing electronics. Thus, the ultrasonic testing electronics has to contain a multi-channel ultrasonic instrument with wall thickness gauging functions which simultaneously connects to several measuring probes. In case of a single-channel testing instrument, at least a multiplexer is required. Such conventional instrument with fixed probes at remote locations would be too expensive and complicated. Fig 1: ECHOMETER-host station with data display (left) and wall thickness electronics (right). 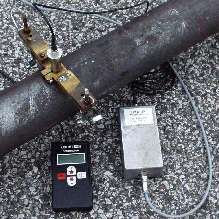 The newly developed measuring system for wall thickness monitoring of endangered locations of piping uses the principle that for each location, an independent measuring electronics (see fig. 1, right) is mounted close to the ultrasonic probe. The electronics contain all functions of a conventional wall thickness gauge, i.e. 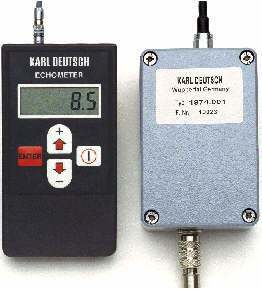 the electrical transmitter, an amplifier with distance amplitude correction (DAC), counter functions for exact determination of ultrasonic travel time, a micro-processor for evaluation and data processing, and also an interface driver to transfer the wall thickness readings via the data cable. Unlike a hand-held wall thickness gauge, a display to show the wall thickness value is not required for the new electronics. Instead, the reading given in mm wall thickness is digitally transferred via a standardised serial two-wire data line to a remote host station (see fig. 1 left, ECHOMETER-host station), where all wall thickness values can be read and stored. The data transfer is carried out with sufficiently high speed (4800 Baud = Bits per second), to transmit all measured values on-line and practically in real time. Since the information is now digitized and is not a high-frequency ultrasonic signal, the cable length does not have any influence on the transfer. The digital signals may be transmitted via cables of up to 100 m length, if a standard RS232 serial interface is chosen. By using the RS485 standard, the cable length can be increased to 1200 m.
Fig 2: Measuring location on pipe with permanently installed wall thickness probe (top), ECHOMETER-host station (left bottom) and wall thickness electronics (right). Fig. 2 shows the gauging system mounted to the pipeline. The ultrasonic sensor is mounted into a prism-shaped holder, and it is permanently pressed to the outer pipe surface with high force by using a steel belt. For acoustic coupling, a special couplant is used, which does not evaporate even at higher temperatures due to its extremely low vapour pressure and allows a permanent coupling over several years. The probe is connected to the wall thickness electronics via a short weather-proof cable and with pressure- and water-tight screwable connectors. The electronic circuitry is mounted within a robust aluminium housing of approx. 120 by 65 by 40 mmł, which is splash-proof according to IP 65. The small size of the electronic circuitry would allow for a further reduction of the housing size, if required for the measuring location. The also weather-proof connection cable between the wall thickness electronics and the host station contains four wires. Two of the wires are responsible for the power supply, which is a low voltage (+5 V). The voltage is generated by the host station. If the host station is active, also all wall thickness electronics are working and wall thickness data is continuously transferred from the measurement locations towards the host station. Fig. 2 shows the entire set-up including the probe, the measuring electronics and the host station which contains a data display (see also fig. 1). The wall thickness value is produced with a resolution of 0.1 mm. A serial data interface (either RS232 or RS485) makes large distances between measurement location and host station possible. For most applications in the petrochemical industry, it is advisable to use the RS485 serial standard. It offers more flexibility concerning the cable lengths (up to 1200m). It also allows for addressing up to 256 remote measuring locations from one host station. The host could be either a simple data display unit (fig. 1) or also a PC, which could then be used for further data processing. This newly presented wall thickness gauging system for fixed installation at endangered locations of pipings has two main advantages: It can reduce the required time and therefore the cost of nondestructiv testing in the petrochemical industry. Secondly, it can increase the operating safety of the plant, because due to the minimized cost of the procedure, the testing intervalls can become shorter. Also, a continuous supervision is now possible. The probe shown in fig. 2 is resistant to long-time temperatures up to 80° C. The wall thickness electronic circuitry can withstand temperatures up to 50° C. Thus, the set-up enables also a supervision of hot pipings. When higher temperatures are expected, special designs are possible. For the construction of the probe, the wall thickness electronics, and the low-voltage power supply, aspects of intrinsic safety were already considered. Therefore, an approval for hazardous areas, e.g. refinery areas, would require only little effort. In a permanent field test under natural weather conditions, where extreme sun exposure, heavy rain and freezing temperatures occured, the wall thickness gauging system (fig. 2) worked reliably for more than one year. Currently, several measuring locations in a chemical plant are under practical test. An increased number of locations is planned. The design of the wall thickness electronics for fixed installation is based on a field-proven modern wall thickness gauge manufactured in large quantities under cost-efficient conditions. Therefore, the expense for this newly presented system is much lower compared to the conventional procedure by saving cost for the inspection personnel. Volker Deutsch, Michael Platte, Manfred Vogt: Ultraschallprüfung  Grundlagen und industrielle Anwendungen (Ultrasonic Testing  Principles and Industrial Applications), Springer Verlag, 1997. Volker Deutsch, Michael Platte, Manfred Vogt, Wolfram Deutsch, Volker Schuster: Die Ultraschallprüfung (Ultrasonic Testing), volume no.1 from the series ZfP kompakt und verständlich (NDT compact and understandable), Castell-Verlag, 77 pages, 1999. Volker Deutsch, Michael Platte, Wolfram Deutsch, Volker Schuster: Messtechnik mit Ultraschall (Measuring Techniques with Ultrasound), volume no.2 from the series ZfP kompakt und verständlich (NDT compact and understandable), Castell-Verlag, to appear in 2002. Michael Platte, Michael Lach, A. Ries: Optimiert  Breite Palette von Ultraschall-Prüfköpfen (Optimised  wide spectrum of ultrasonic probes), 1994. Michael Platte, Michael Lach, A. Ries: Piezoelektrische Schwingermaterialien für Ultraschall- Prüfköpfe (Piezoelectric Materials for Ultrasonic Probes), 1996. Michael Platte, A. Ries: Ultraschallprüfköpfe für extreme Temperaturen (Ultrasonic Probes for Extreme Temperatures), 1991.